Children's TV classic The Banana Splits is getting a modern makeover. Fleegle, Bingo, Drooper and Snorky are to star in new comedy shorts and music videos on the Cartoon Network in the US, and its website, from September. A series of DVDs, live concerts, music CDs, and online games from the anarchic crew are expected to follow. "Everything that made The Banana Splits popular in the '60s is back, including the group's terrific humour and music," said Jordan Sollitto, of Warner Bros.
"We take great pride in having carefully updated the look and feel of the original show for today's kids while retaining all of the elements that made the original Banana Splits such a hit." 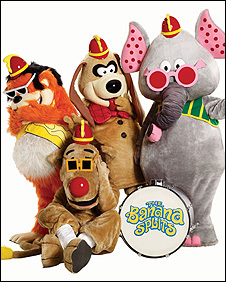 The Banana Splits came onto the scene in 1968 as hosts of The Banana Splits Adventure Hour, a show created by Hanna-Barbera that featured comedy and music videos. They are a costumed rock band made up of Fleegle (a dog), Drooper (a lion), Bingo (a gorilla) and Snorky (an elephant) who hang out in their Banana Pad while playing music and telling jokes. The show's theme song, The Tra La La Song, quickly became a classic. The new shorts share the same "groovy" look of the original TV series. "The Banana Splits is a classic that has been entertaining kids for years," said Stuart Snyder, president of Turner Animation, Young Adults and Kids Media. "We're thrilled to have this new version on Cartoon Network for our kids to enjoy today."